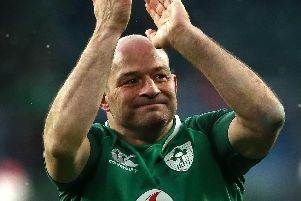 McFarland took up his head coach duties on Monday after the Irish and Scottish unions finally reached agreement over his early release, almost four months after he was named as Jono Gibbes' successor. McFarland's contract as Scotland assistant coach had been due to run until January and Best feels he has arrived at an ideal time. While operations director Bryn Cunningham assumed overall charge, coaches Dwayne Peel, Jared Payne, Aaron Dundon and Kevin Geary have continued to prepare the players ahead of their Guinness PRO14 opener against Scarlets on September 1. "It just gives certainty," the Ireland captain said. "It hasn't actually changed a lot of what we have done. We have had that consistency of Jared, Peely and Aaron Dundon with Kevin Geary in there. We have worked really hard on the skills with Dan Soper coming in, Peely with his stuff, defence with Jared and we have been pushed hard physically. So we have been able to get all that work done. "Ye, you always want him in straightaway so he can oversee everything, but in terms of the timing with a week of pre-season and a week to prepare for the first game, and the boys are physically ready to go, it's just a different mental twist to it. "He had his first meeting on Monday morning and it was just good to have him there and be around and finally get to meet him. "I knew him, but for guys who have only ever seen him from the newspaper press release when it was announced, and all the speculation, for them to meet him and for him to sit down in front of the group for the first time was reassuring for everyone. "Dan didn't want to come in like a sledgehammer approach. He has used the early part of the week to watch what's going on from a defensive and attacking point of view. "We have had that continuity and Dan being Dan and being very thorough, he is seeing how things are done. You want him to add value and not take away from what the boys have done all summer and so far he has done that."